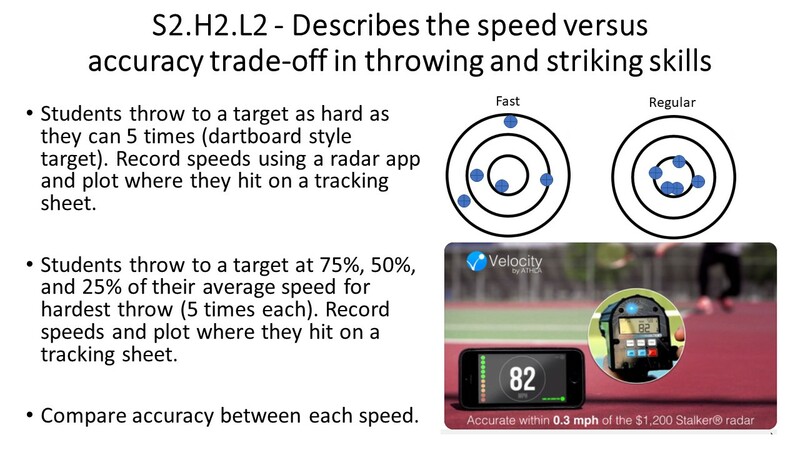 Athla Velocity: A hands free speed radar using your phone. Check out this example activity using the app. Cardiograph: Cardiograph is an application which measures your heart rate. ​Heads Up! : Create your own custom deck to have your students review content and have fun. See this example in Physical Education. Question Generator: Using SOLO Taxonomy as a framework, this app generates questions to bring in ideas. ​Shot Tracer: Track the flight path of any object. SprintStart: Practice sprint starts and test your reaction time. SprintTimer: Photo finish app that employs the same techniques as the fully automatic timing equipment (FAT) used at the Olympics. ​Blacktop PE: Comprehensive physical education assessment tool. ​Fitness Tests - For PE Teachers and Coaches: The app allows for swift reference of over 30 fitness tests from aerobic capacity to flexibility. HomeCourt: Real-time shot tracking and analysis for Basketball. ​​iSOFIT: Obtain simultaneous objective data on student activity levels, the lesson context in which they occur, and more. ​Move Improve: Helps learners work on basic physical skills through giving and receiving feedback from peers. ​​SwipeStats: Users can observe a match and capture actions including: number of passes complete, success rate of tackles, time of possession, and more. ​​eGrader: This app makes it easy to calculate student grades (%s). Enter the number of points possible and it will give you a % for each score. Groovy Grader: This app makes it easy to calculate student grades (%s). Enter the number of points possible and it will give you a % for each score. Easy Rubric: Designed to minimize the time and effort involved in assessing students and classes of all ages, levels and learning environments. Quick Key Mobile: Use your smartphone to grade scantrons. Decibel 10th and Too Noisy Pro: Monitors the noise level in your class. Remind: Remind offers teachers a free, safe and easy-to-use way to instantly text students and parents. ​Smiling Mind: Smiling Mind is meditation made easy. A simple tool that helps put a smile on your mind anytime, anywhere and everyday. ​Stop, Breathe & Think: A meditation and mindfulness app that helps you find peace anywhere. AR MeasureKit: MeasureKit makes it really easy to measure different things in the world using your iPhone’s or iPad’s camera. drllz: With drllz you can design and share your drills with players before a training session or update during a game. GooseChase: Create custom scavenger hunts. Bitmoji: Create your own emojis (example). ​ChatterPix: Turn any object in a photo into a talking object. Clips: Interesting filters that can be applied to videos (example). ​DMD vClone: Merge multiple videos into 1 video. Can be used for skill demonstrations, choice of exercise, and more (example). ​Green Screen: Makes it easy to create incredible green screen videos and photos. See the example "Physical Snack" to the right. Sportfie: Capture game highlights without having to film! ​​Superhero Comic Book Maker: Create personalized animated comic books with monsters and superheroes. Voki: Create customizable speaking avatars for teachers and students.